Here is the list of best free hard drive speed test software for Windows. These software put your hard drive to test to find out its read and write speeds. Do not worry, as these software do not put your computer under stress or extreme test. A test file of given size is made to read and write on hard drive, while subjecting it to given data block sizes. The listed HDD speed test software are different from each other, as they use different techniques to test hard drive speed. Some of these software are dedicated hard drive speed test software, while some are computer monitor software, which display hard drive stats, along with stats of other computer hardware. You will also find some hard drive benchmark software, that test HDD speed before benchmarking. All in all, the mentioned software will prove out to be helpful if you are looking for a solution to find out read and write speeds of your hard drive. Some of these HDD speed test software also provide real time, average, maximum, and minimum real and write speeds. So, go ahead and checkout the brief description of these software to select what suits you the best. Also let us know, if you know any better hard drive speed test software than these. I like ATTO Disk Benchmark the most, as it lets you define the test file size, and select the memory block range to subject hard drive for speed test. Along with comparative read and write speeds of hard disk, it also displays graphical representation, so that it would be easy for you compare result for different memory blocks. You can also checkout the list of best free Hard Drive Repair Software, Hard Disk Encryption Software, and CPU Usage Monitor Software. ATTO Disk Benchmark is a free hard drive speed test software, which you can use to test HDD read and write speeds. It lets you check for read and write speeds of the drive partitions separately. What it does is, it checks read and write speed for a given test file of custom size by subjecting it to different transfer rates. For each transfer rate, read and write speeds are displayed in MB/sec. Graphical representation of speeds are also displayed for better analysis of hard drive speed test. As you can see in the above image, this HDD speed test software lets you select the drive, data transfer size range, and the size of test data. Once you begin the test, it takes a while to complete the test, and test results for various data transfer rates are displayed one after another. If you want, you can either save the test result as .bmk (benchmark result) file or take a print out. NovaBench is a PC benchmark software that also performs hard drive speed test. The limitation with this software is that it only displays hard drive write speed. Along with hard drive speed test, it also performs various other tests to display RAM speed, CPU operations/sec, and GPU fps. With the test result, respective scores are displayed. If you want, you can use this freeware to compare results online. You also get an option to save the test result in .nbr (NovaBench Result) format. Its a pretty simple yet useful software that can be used as a HDD speed test software. Parkdale is a dedicated and free Hard Drive speed test software. It runs test on your HDD to display Write and Read speeds in MB/sec. There are 3 test modes that can be used to determine read and write speeds. QuickAccess: In this mode, test is run on selected drive for read and write speeds. A test file of given size is used to perform speed test. 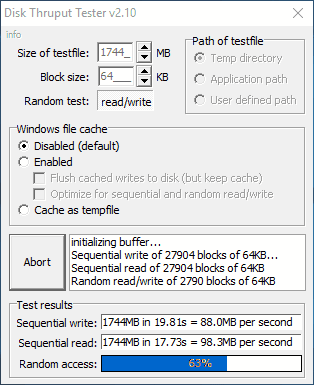 The block size to read/write test file can be selected from 64 kB or 1 MB. Results are displayed once the test is complete. FileAccess: In this mode, you get to select any normal file as test file to commence hard drive speed test. 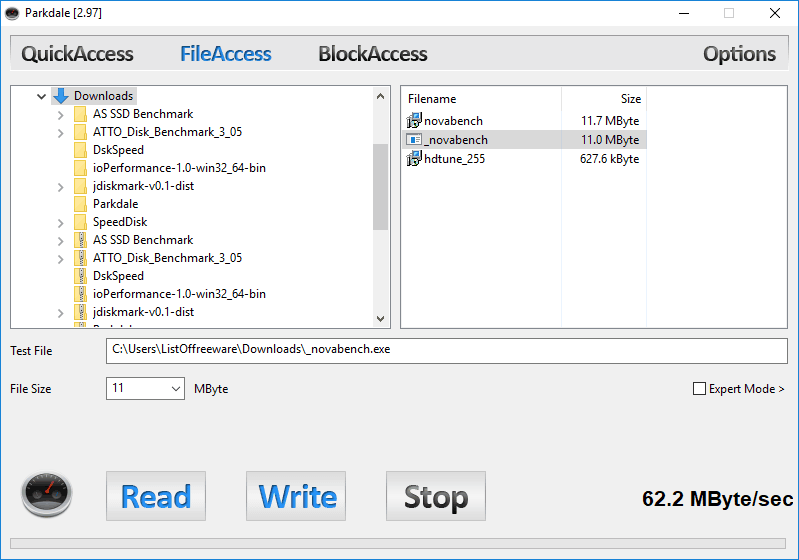 BlockAccess: Read and Write speeds are determined by directly reading or writing test data to disk sectors, without the use of filesystem. This tool is also available as a command line hard drive speed test software on its download page. You just need to run this command line utility by clicking on its icon. It automatically processes test data to determine read and write speeds on HDD. The test result is displayed in notepad, which consists of read and write speeds, along with test time and date. Parkdale is also available for Mac and Android OS. DiskMark tests and displays hard drive read and write speeds along with graphical representation. It lets you select a particular drive, set size of test file, and define values of data Rounds and Runs. Based on the test data, its runs the test and displays real time, average, minimum, and maximum read and write speeds. Also, it displays the time taken to read and write the test data. Graphical representation of read and write statistics is also displayed. This helps you with a careful analysis of test data. It is a simple HDD speed test software with not many advanced options. Option to save or print data would have been a great addition to this freeware. My HDD Speed is a simple HDD speed test software that does not require you to enter any parameters for speed test. All you need to do is select a drive on which you want to perform test. Average HDD read and write speeds are displayed along with maximum read and write speeds. As you start this software, it minimizes to system tray. Click on its icon in the system tray to view its floating interface. On the floating interface, you will find the icons of the drives on your computer. Click on a drive to begin read/write speed test. Once the test is complete, average read and average write speeds are displayed. The maximum read and write speeds recorded are also displayed. If you want to save the test result of this hard drive speed test software, an option to save the snapshot of recorded data is displayed after the test is complete. Disk Throughput Tester lets you test hard drive read and write speeds by subjecting it to usual PC conditions. You can define the size of test file, set block size for file transfer, select path of test file, and enable/disable Windows file caching before commencing test. The best part about this HDD speed test software is that, you can choose from different test file paths to check respective read and write speeds. You can choose to read and write test file via Temp directory, Application path, or User defined path. Also, enabling caching provides normal Windows condition to test read and write speed. Once the test is finished, read and write speeds are displayed in MB/s along with RAM usage. Although the options to save or print test results are missing, this freeware does what it promises. Bart’s Stuff Test is an old but very well known hard drive speed test software. A hard disk drive can be selected to find read and write speeds. As you begin the speed test, it starts processing data for predefined values of test file and block size. Total number of blocks, size of data, real time speed, maximum speed, and average speed are displayed for Read and Write operations. Data log can also be viewed on the interface. One of the options lets you only commence the test for hard drive read speed. As you can see in the above picture, the interface is pretty neat and displays test results in easily understandable manner. The free version of HD Tune lets you test and view hard drive read speed. You can also view detailed Hard drive info and scan it for errors in the free version. Minimum, maximum, and average HDD read speeds are displayed along with a graphical representation of hard drive read activity. Additional info, such as HDD temperature, access time, burst rate, and CPU usage are also present on the interface. You can save the test result on your computer as an image. CrystalDiskMark is a dedicated hard drive speed test software for Windows. It lets you select and test a specific drive for speed test. You are allowed to set test file size and block size for file transfer. Several tests are run and result is displayed for read and write speeds for Sequence and 4K data with/without queue depth of 32 in MB/s. Its pretty simple and easy to use freeware, and does not comes with many advanced features. Test result can be saved in TXT format. Option to change interface theme is available. 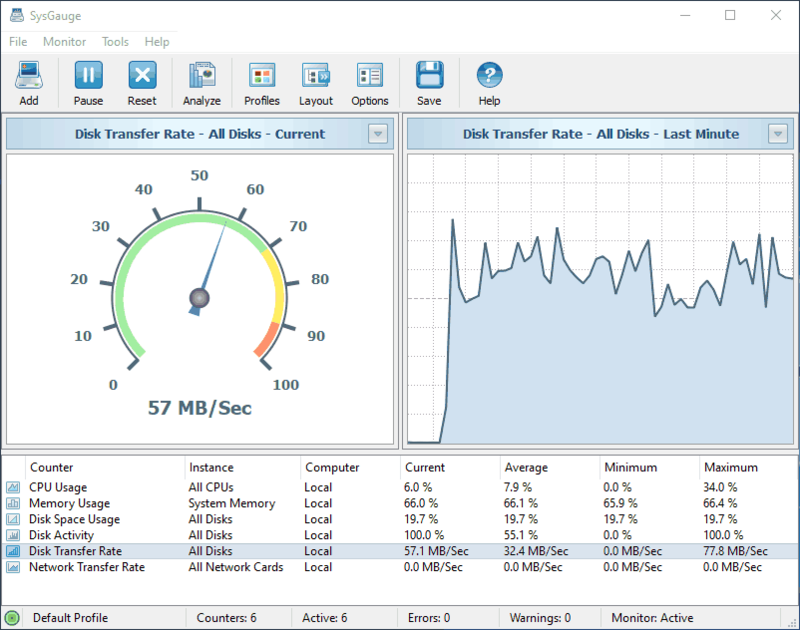 Roadkil’s Disk Speed is another free HDD speed test software for Windows. It can be used to test overall hard drive read speed. It displays Linear Read Speed and Random Read Speed for different memory blocks. The memory blocks for which HDD read test result is displayed, ranges from 0.5KB to 1024KB. Along with the read speed, a brief result is also displayed. Here, you can view access speed, cached speed, max. read speed, and overall score. There’s another tab available here, which displays Disk Info. Access it to view info related to hard drive, such as: total disc sectors, disk size, serial number, file system, etc. ISP Monitor is a free Internet monitor software mainly developed to monitor internet activity; however, it also displays real time hard drive read and write speed. So, whenever a hard disk drive reads or writes data, real time read and write speeds are displayed on a floating disk monitor interface. Along with HDD speed, total, and free disk drive space are also displayed. It cannot carry out speed test to display average hard drive read and write speed, but only displays real time speed. You can activate or deactivate the HDD monitor floating interface from the View menu. DiskCheck is another good HDD speed test software for Windows. It performs speed test on your PC’s hard drive and displays its read speed. The hard drive read speeds at the start of testing, at the end of testing, and while using cache are displayed. The test is performed for whole hard drive and not just a specific drive. Other options available let you view disk sectors and respective data. The MultiTest option runs speed test on drivers and flash drives connected to your PC. If you just need the hard drive read speed, then this hard drive speed tester software can be a good option for you. HWiNFO displays your computer hardware’s statistics. You can use it to view Hard Drive read and write speeds. In the Drive section, it displays the following data about HDD: Read rate, Write rate, Total read data, Total write data, Read activity, and Write activity. It not only displays real time hard drive read and write data, but also displays minimum, maximum, and average read and write speeds. Apart from Hard Drive statistics, real time statistics of other components of PC are also displayed. Its a very useful software to keep an eye on various components of your PC. GPU Monitor is primarily a software to monitor graphic card performance and statistics. You can utilize it to monitor hard drive read and write speeds and statistics of various other components of your PC. All of this info is displayed on a visually attractive interface. By default, it displays GPU statistics on its interface. You can customize its interface from the options menu to display hard drive info along with other info. In separate sections, you will be able to view statistics of various drives of your hard disk. 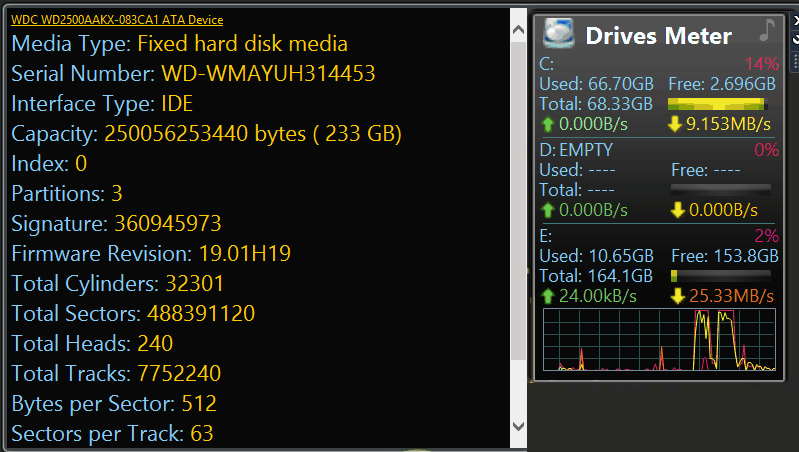 For each drive, it displays real time read and write speeds in MB/s. Also, the read write statistics are displays in a visual form. You cannot run tests to view average hard drive read and write speeds. Sidebar Diagnostics is a well known Windows utility to keep an eye on computer’s performance. One of the tools in Sidebar Diagnostics lets you view real time read and write speed of disk drives separately. The read and write speeds are displayed in MB/s. Apart from that, used and free space, along with load in percentage is also displayed for hard disk drives. The interface of this software places itself on the right side of your desktop, keeping it easy for you to always keep an eye on your computer’s performance. 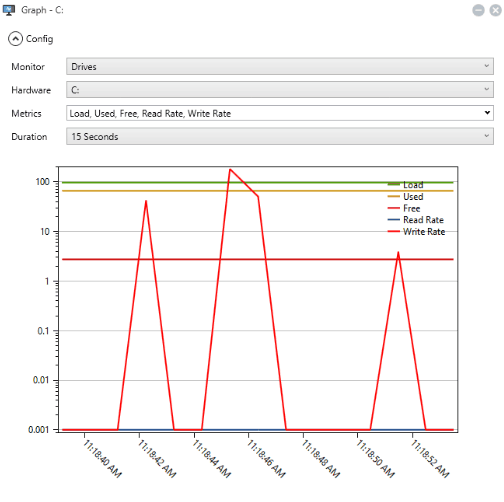 SysGauge is another computer performance analysis software for Windows, which can be used to test Hard drive speed. It displays overall HDD data transfer speed, which includes read and write speeds. It displays current speed, average speed, minimum speed, and maximum speed of hard drive transfer rate. You can also view a graph of disk transfer activity for last minute. This freeware also displays CPU usage, RAM usage, HDD space usage, and network transfer rate. So, it can be used to monitor overall PC performance. 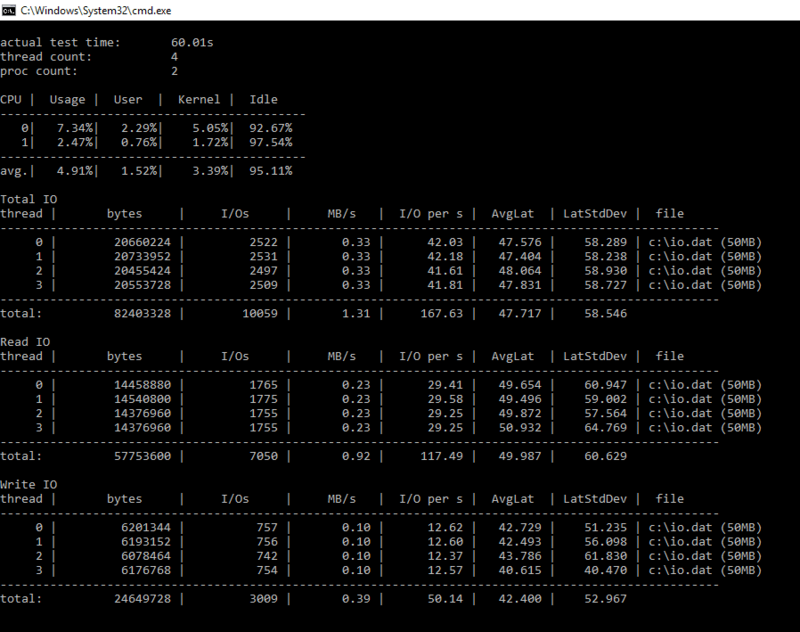 Diskspd Utility is a command line Hard Drive speed test software for Windows from Microsoft. You can define hard drive speed test parameters in the command to run test and it displays an extensive test result. It displays read and write speeds of hard drive in MB/s and I/O/s. there are various parameters that can be set in command to get test result accordingly. You can set the size of test file, block size, time to run sequence, i/o threads, target disk, etc. All you need to do is, open Command Prompt and navigate to the folder where this tool has been downloaded. Now run the command to get the read and write speed of hard drive right in front of you. You will also find command help in a user manual, that downloads with the exe file of this software.